My boys had a blast with this dart blaster! I received a toy from Buzz Bee to facilitate this post. The weather is finally nice enough for outdoor play and the boy's and I headed up to the park to try out a new toy. I am glad that the park is only one block from our house so we can head there quite often. The boys like the bigger space of the park for their adventures and head up there for the chance to play with friends. 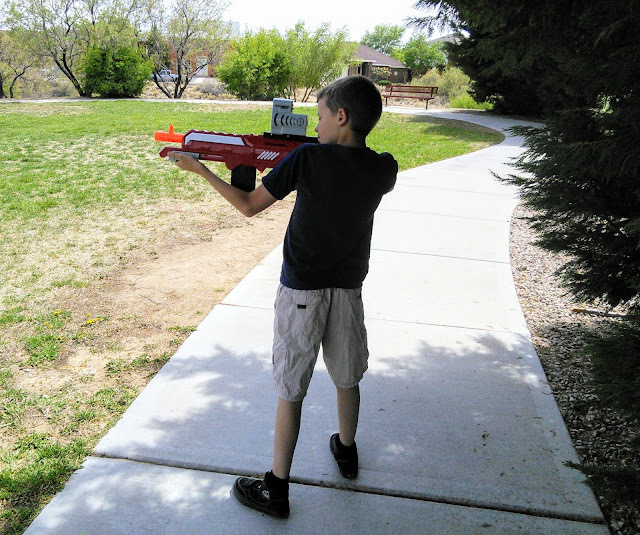 The boys were excited to try out the Thermal Hunter from Buzz Bee and needed the space of the park as this blaster can send the darts up to 90 feet. If they played with the dart blaster in the yard, they would be having to hop the fence to retrieve the darts as we have a small yard. Backyard blaster battles will be elevated to a whole new level! The Thermal Hunter was easy to put together and did require 4 AA batteries for the awesome HeatSeeking Scope. The boys quickly determined that the HeatSeeking Scope would work best with the darkness of nighttime as it was hard to see the red light outside. This scope works by detecting a heat source up to 60 feet away, pretty cool in my opinion. So mom was left to hold the Heatseeking scope and the extra darts. The dart clip held 10 darts and the blaster came with 20. I like when there are plenty of darts so I am not having to replace them right away. My boys got into their action poses and the fun began! 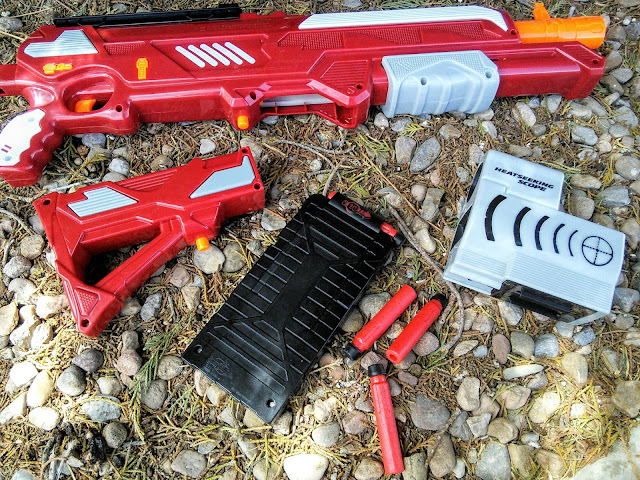 With a couple of pumps, the dart blaster was ready to shoot darts. They took turns blasting the darts across the park. It was a good thing the foam darts were red as that made it easier to see them in the grass. 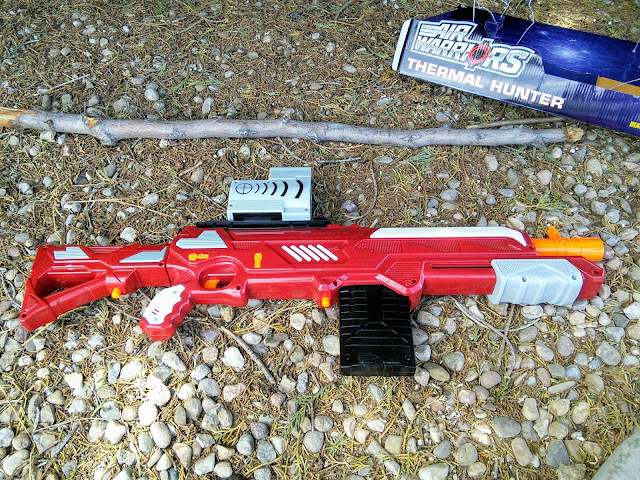 I was amazed that the darts flew far into the air as the Thermal Hunter has the power to shoot them up to 90 feet! One person shot the darts and the other chased after them to pick them up. Then they switched places. Next time, the boys are going to bring their other dart toys and practice target shooting. 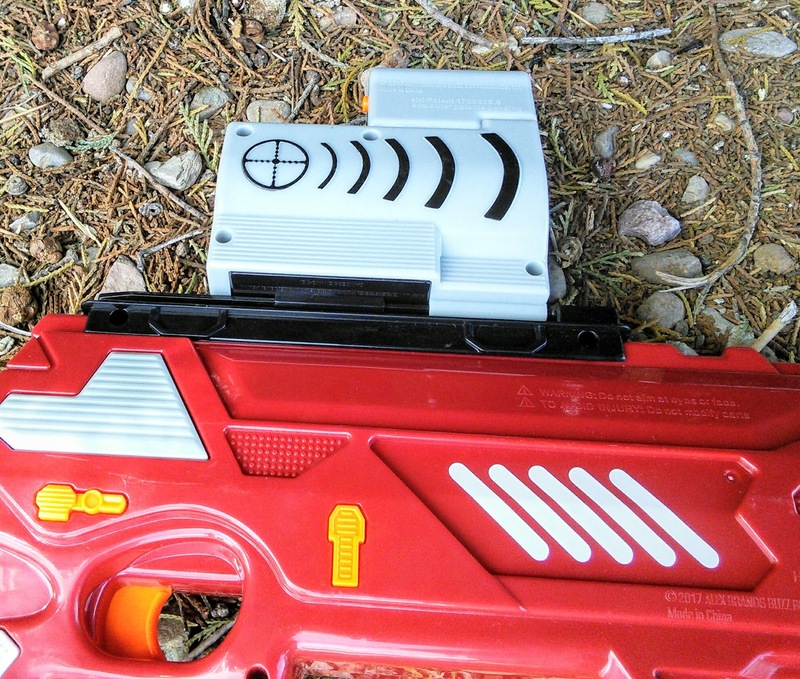 The boys informed me that the this cool Dart Blaster from Buzz Bee Toys came with an adapter so it could be used with other popular brands of dart guns. 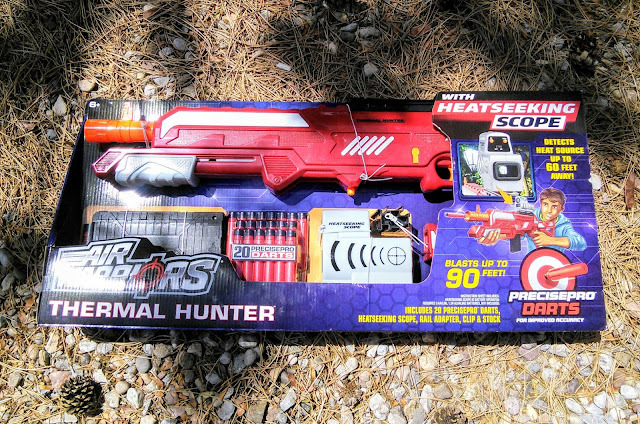 This blaster is the perfect birthday gift for any kid. The boys knew that this Thermal Hunter would be great to bring up to the park next week when we had a playdate with friends. This smart mom knew that this toy would be an awesome gift for all those birthday parties that the boys get invited too. One can never have enough dart blasting toys! Ok now how cool do these look, I can't believe it can shoot the darts up to 100 feet that is crazy! Definitely something for a day in the park. This looks like fun! I know a few kiddos who would LOVE to have one or two of these! That looks like a lot of fun. I have a nephew that I think would LOVE this. Looks like a fun toy. My son will love it, I need to buy it for him. I'm not a fan of toy guns but I know a lot of families that love them. That does look like a lot of fun especially this summer! I'm sure the kids will love it and it's going to keep them busy and occupied! 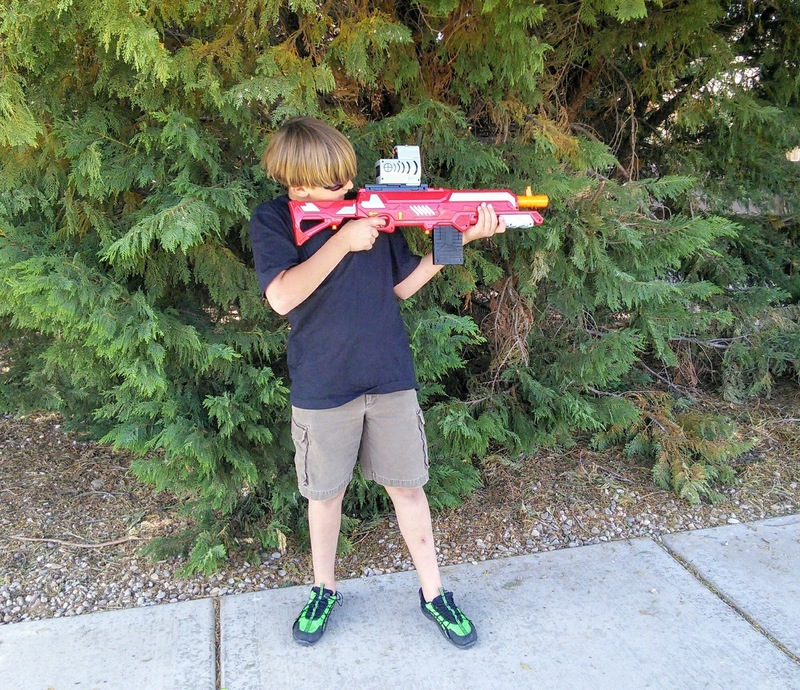 My boys love nerf guns. I always have to get extra pieces though as they just tend to lose them so fast. I'll have to keep this one in mind when their birthdays approach in a few months.